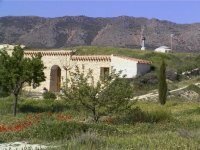 VILLAS AND APARTMENTS TO RENT IN GRANADA, SPAIN. 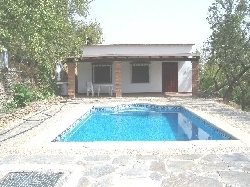 Welcome to our selection of holiday homes to rent in Granada, Spain. The historic and beautiful city of Granada is one of the most popular tourist destinations in the whole of Spain and common day trip for those staying on the Costa del Sol or the Costa Tropical. Dominated by the Moorish palace of the Alhambra, the old town of Granada is full of buildings that look more North African than European, as well as a vibrant night life that is popular with tourists and local students too. There are several historical districts within Granada, many with their distinct characteristics and stories. The Albayzin region is the one that most reflects Granada's Islamic history, with ornate buildings and narrow streets that hide courtyard gardens and fountains. Sacromonte, one of the hills that makes up Granada, is the gypsy area, and you can still visit the picturesque caves where they lived in the past and hear authentic gypsy guitarists performing for the tourists. The Cartuja district is home to the Carthusian monastery, an opulent religious building that welcomes visitors on organised tours. Finally, the Bib-Rambla region is the site of not only the weekly market, which completely takes over the narrow streets around the Cathedral, but is also where many of the best restaurants are to be found, many serving specialities that have existed in the city since the days of Al-Andalus. The highlight of any visit to Granada is a tour round the Alhambra palace and fortress and the surrounding gardens. Not only is the building itself one of the most amazing sites in all of Spain, but once you've climbed to the very top of the remaining walls, you can enjoy a unique view over Granada and the rest of Andalucia. Guided tours are available in English, or you can walk around yourself with an audio guide if you are pushed for time; though visitors should ideally set aside two or three hours to make sure they don't miss any of the Alhambra's attractions. The Alcazaba, or fortress section, is where you can enjoy the spectacular viewpoints and where the walk around the remaining defensive walls and towers starts. Not for the faint-hearted, especially in summer temperatures. The most beautiful architecture and artwork is found in the surrounding palaces while the courtyard gardens or Generalife are a great place to get a picture of the Alhambra itself, as well as enjoying a pleasant stroll in the shade. 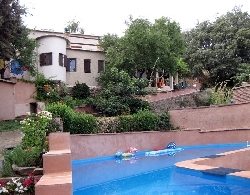 Looking for self catering holiday accommodation in Granada? Then below is a selection of holiday apartments in Granada and holiday villas in Granada that can be rented direct from their owners. You can either click on each listing for further details or you can use our search engine on the left if you are looking for something in particular. Why not visit Granada's cathedral? It was built on the land where the old mosque was situated. The former mosque was replaced by four buildings, which are the cathedral, the Sagrario, the Merchants' exchange and the royal chapel. The cathedral took a total of 180 years to build as they started building it in 1523 and it was not completed until 1704. Several architects were involved in building the cathedral including Juan Gil de Honta��n, Enrique Egas and Diego de Siloe. Capilla Real (Royal Chapel) - The Royal Chapel took a total of 16 years to build between 1505 and 1521 and was designed by Enrique Egas. It was built to be a future burial place for future kings and queens but the monastery in El Escorial was used instead. However when Queen Isabel and King Fernando died just before the Chapel was finished, they were buried there along with King Felipe and queen Juana. The tombs were carved out of marble by the Tuscan sculptor Domenico Fancelli. Paseo De Los Tristes - Paseo De Los Tristes stands for promenade of the sad. The square lies opposite to the River Darro. The square got the name promenade of the sad because it used to be where funeral corteges passed through on their way to the cemetery. It is also known as Paseo del Padre Manj�n. It is named after a priest who founded a school for poor children in the Sacromonte. The square and the fountain was created in 1609 when they were redesigning the area and has been a lively place ever since. Santo Domingo - Santo Domingo was originally a part of the Santa Cruz convent. Work started on the landmark in 1512. Tombstones from the former Moorish cemeteries were used during its construction and nobody actually knows who the architect responsible for the building was. Plaza Isabel la Catolica - The Plaza Isabel la Catolica is a square when the famous status of Queen Isabel granting Columbus' petition to obtain ships and supplies. Even though the statue is now located in Spain, it was created in Rome, Italy 1892 by Mariano Benlliure and for a while was located in the Paseo del Sal�n. Casa de los Pisa - The Casa de los Pisa is a museum full of religious artifacts, which are all dedicated to Saint John of God. It is a good place to visit if you have an interest in typical Spanish religion. Plaza Nueva - Why not walk along the plaza? The Plaza Nueva square was built over the river Darro for the purpose of creating more space within the city. It didn't take long before the square became popular and supposedly host events such as bullfighting, tournaments and even public executions. Late-night jazz and flamenco club. Italian pizza restaurant in Granada. Granada is a beautiful and historic city. It is considered one of the most popular tourist destinations in the whole of Spain and is located next to the Sierra Nevada Mountains in Andalusia in the south of Spain. It is also an estimated 70km from the coast, which makes it possible to go both to skiing and the beach in the same day.